I'm sure you've seen the title of this issue and rolled your eyes just like I did. Another book focused on Wolverine? What, the twenty other regular monthly appearances weren't enough for Marvel's most over-used character? Well, calm those furies for at least a moment, because The Amazing Immortal Man and Other Bloody Tales isn't playing the same game as its peers. Where each of the Canucklehead's other regular monthly appearances focus on the character's straightforward superheroic adventures, Immortal Man writer David Lapham instead explores the concepts that made Wolverine so compelling a character in the first place. There's no showdown with Sabretooth at the end of this issue, no battle with ninjas in ancient Japan or jarring revelations about Logan's forgotten ancestors. Instead, the double-sized issue features a trio of short stories that take the character in very different directions. While he does occasionally have his faults, the two universal consistencies in David Lapham's work are his strong characters and his imaginative plots. Both are evident in full force in Immortal Man. Under his watch, Logan is more than a man… he's a force of nature. Is he easily misled? Sure. He's never been portrayed as a genius, but he's also never been seen as someone to be trifled with. 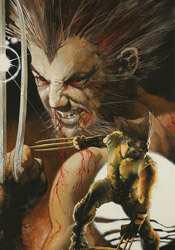 Wolverine's greatest stories have all come when he's been deeply betrayed, his blood boiling with a thirst for revenge. Lapham's best work has come when he can merely set the stage, nudge the first domino and document the reaction. They make a great match. The majority of this issue's narrative is through the eyes of the observers. Logan himself, who's seen as everything from a freak show to an inspiration by the time the issue draws to a close, barely even gets a speaking role. While the book's three stories have little in common as far as plot points are concerned, they do share a common premise: an examination of the impact a chance encounter with Logan has on the lives of otherwise-ordinary people. That's something that I've discovered is easy to forget – while the concept of a short, hairy, impervious man with razors embedded in his forearms may have lost some of its impact on readers after years of over-saturation, it should still come as something of a surprise to the common denizens of the Marvel Universe. Seeing something like that in print is entirely different from seeing it out on the streets, and an encounter with somebody like Logan should certainly have a profound effect on an individual. The accompanying artwork is about as vastly different from one story to the next as I can imagine, but none of it is really all that good. The first chapter is probably the strongest of the three in this regard: Johnny Timmons's thick, gestural style is minimal, but effective and matches the mood and the setting of the story in the mid '30s. Lapham himself handles the artwork for the more outlandish second chapter, displaying several peaks and valleys despite the story's relatively short length. It's not his finest work by any means, but it's good enough, especially when contrasted immediately by Kelly Goodine's mildly clichéd work in the closing chapter. Goodine's work is stiff and over-detailed, and his Logan would be unrecognizable without that trademark hairstyle. This is a tough sell. The artwork is barely worth mentioning, and while I applaud Marvel's decision to give David Lapham the freedom to do whatever he wants within this issue, some of the material is in desperate need of an editor's heavy touch. The only story really worth your time is the first, and even though that tale runs a mere eleven pages, I don't think it would benefit from any further elaboration. Lapham is a genius, but sometimes he's a mad genius, and this isn't his best showing. Flip through it but don't do much more.